Firstdraft. Opening 06.03.19. Artist Talks 28.03.19. Cindy Yuen-Zhe Chen's exhibition of experimental drawings, video and sound installations. JUNE 20 to JULY 8. Drawing Feedback performance at 3:30pm. is an exhibition of abstract drawings curated by Charlotte Watson. Come see it at Five Walls Projects in Footscray Melbourne! Cindy has been invited to undertake an artist residency in Ningbo Museum of Art in China. Cindy will hold a studio presentation and exhibition as a part of the program. Ningbo Museum of Art will also select two of Cindy's works for the museum's permanent collection. Cindy will be undertaking a second residency at Murray's Cottage as a part of her PhD research into listening as a methodology of drawing iconic landscapes. Cindy Yuen-Zhe Chen has been selected for Art Nova 100 and she will be exhibiting as part of the exhibition in Today Art Museum in Beijing from July to August 2017. Art Nova 100 is an annual event nominating 100 artists from across China with a small selection of international artists who were born on or after 1975. Selected artists will present work in a variety of media, including oil painting, sculpture, ink on paper, printmaking, photography and installation. Cindy Yuen-Zhe Chen will be exhibiting in the Willoughby Visual Arts Biennale as a part of the exhibition Home Grown at the Art Space on the Concourse at Chatswood, Sydney. The Biennale will run from 6-24 September 2017. 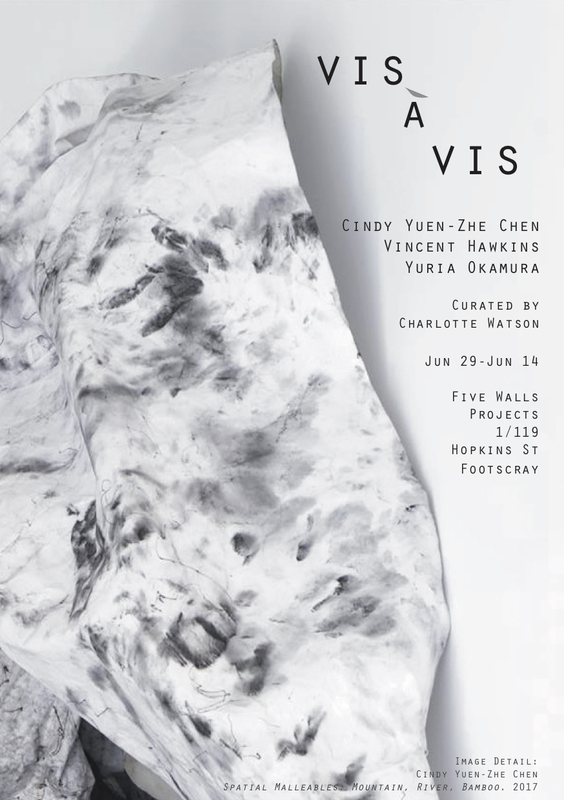 Cindy Yuen-Zhe Chen will be exhibiting in a duo show with Claudia Chan Shaw at Art Atrium's new gallery space at Jones Bay Wharf. Please join the artists for the exhibition launch on Saturday April 1 from 2:30 to 4:30pm. Cindy will be holding an informal artist talk on Wednesday April 19 at 6pm. Take the lift (behind the bright yellow pillars) from Pirrama Rd to the upper deck, suite 48 is near the end on the left hand side. The gallery is a 15 minute walk from Town Hall Station. By car, there is more street parking available on Point Street. The upper deck can be accessed on foot through the boomgate on Bayview Street (which is invisible on Google Maps). Cindy Yuen-Zhe Chen will be the Artist in Residence in Murray's Cottage from December 6th 2016 to January 9th 2017. During this residency, Chen will document her aural and visual engagement with place through experimental drawing and field recordings. Please visit the Hill End website here for more information. Cindy Yuen-Zhe Chen has been selected for the 2016 Fellowship Program at Akiyoshidai International Art Village in Yamaguchi Prefecture, Japan. During her residency from October 2nd to 29th, she will conduct site investigations through an experimental drawing practice and environmental field recordings. In the final week of the residency, Chen will hold sound drawing workshops for children and adults from the local community. For more information, please visit the Akiyoshidai International Art Village website here. Chen's second solo exhibition, curated by Shivanjani Lal will be exhibiting at Gaffa Gallery, Sydney, New South Wales. As conversation 6 from The Narrative of Location series, this work features a kinetic installation of painted silk which can be viewed on the installations page. Click here to read a short description by emerging curator and arts writer Sophia Cai. Chen's work 'Stretched Thunder' is a finalist in this year's Paddington Art Prize. Please join the artists for the opening on Thursday 22nd October, 6-8pm at 111-113 Queen Street, Woollahra, New South Wales, 2025. Group exhibition at Seventh Gallery curated by Shivanjani Lal, featuring artists Cindy Yuen-Zhe Chen, Dale Harding, Hernan Lopera, Léuli Eshraghi, Liam Benson, Sacintya Simpson, Shivanjani Lal, Stéphanie Kabanyana Kanyandekwe. Click here for more information about the exhibition. Seventh Gallery is an Artist Run Initiative at 155 Gertrude Street, Fitzroy, Victoria, 3065. The birth of thunder 19:48:50, 2015, Ink on Wenzhou paper, H97.5 x W140cm. A solo exhibition by Cindy Yuen-Zhe Chen will be showing at Art Atrium. Please join the artist for the opening on Saturday 14th February from 2:30-4:30pm at 181 Old South Head Road, Bondi Junction, New South Wales, 2022, Australia. Click here to view the artist statement. Cindy Yuen-Zhe Chen will be exhibiting as a part of the group show Openings at AirSpace Projects. Please join the artists at the opening on Friday 6th February from 6 - 8pm, at 10 Junction Street, Marrickville New South Wales, 2204 Australia.